Admittedly, I was walking on a cloud; my grin spanned from ear to ear, my footsteps were as light as a feather and my gait could only be described as jaunty. It’s a wonder that I wasn’t in fact skipping. In my euphoria I was convinced that I was Tinkerbelle – that is if Tinkerbelle was dark hair, dark eyed fashionista with a great tan and a designer purse…but I digress. My dinner date with a secret admirer had left me in a state of bliss even three days later, I knew it would wear off, but that I was hanging on to it tooth and nail. Dominick had turned out to be way more charming than I had ever anticipated and our great dinner had lingered until Casey and Colin had said their goodbyes and the staff at Mistral had kicked us out. After a long midnight walk I ended up home in the wee hours of the morning. I was also a little elated by the prospect of having dinner at Fugakyu my favorite Japanese Restaurant and catching up with Mel. Melanie had been in New York for the week and had missed my latest escapade. I was also dying to hear what was going on in the Big Apple. Fugakyu is located in the heart of Brookline. The restaurant’s interior is composed of features Koi pond, stone fixtures and bamboo décor. We were seated in a booth with a sliding door composed of translucent paper over a frame of wood or shoji. Mel had come back from New York looking better than ever – in fact trimmer than ever, no small feat for someone like Mel and I was dying to find out how, but first appetizers. 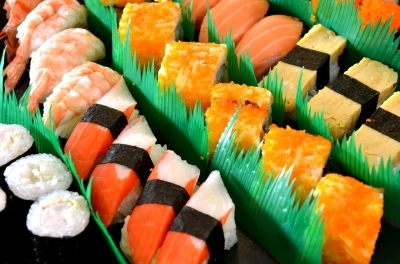 My stomach growled at the thought of sushi. We started with the grilled Chilean sea bass marinated with miso and some soft shell crab tempura. Even though she lived in Boston, there was something about Mel that was so New York – it didn’t hurt that she was there every other month. Mel was convinced that she had found the fountain of youth and it was at the Isabelle Bellis Salon. It takes six months to get a facial with skin care specialist, Isabelle Bellis, a protégée of cult Parisian facialist Joëlle Ciocco. Over the course of great sushi – spicy hotategai (chopped scallop, tobikko, spicy mayo, & scallion), Binnaga (seared albacore tuna), Ikura (salmon roe), spicy salmon maki, jalapeno tuna maki, salmon skin mai, catterpillar maki, lobster maki and spider maki – she told me about the treatment. My former life as a Parisian had me on the cutting edge of such beauty treatments. Lymphatic massage and lymphatic drainage detoxifies your skin. In fact, a couple sessions a week is enough to go down a dress side. Listening to Mel’s experience made wonder if I need to add a little Paris back in to my life, but right now from where I was sitting (and thinking of Dominick) Boston was looking pretty good.